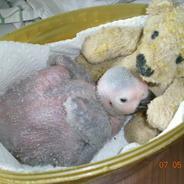 The African grey parrot is a medium sized bird that has a history of being kept as a pet for over 4000 years. They were kept as companions by the ancient Greeks, a custom that was later continued by affluent Roman families who kept them in flamboyant cages. 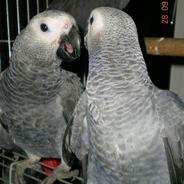 There are two sub species of the breed, the Congo African grey and the Timneh African grey. The Congo is slightly larger than the Timneh and has red tail feathers. The Timneh usually has a darker colouration than the congo and has maroon tail feathers. Getting African greys to mate and breed can be problematic as the birds have no specific mating season, initially the best way is to house a male and female in a cage until they have bonded (look for sitting next to each other engaging in mutual preening). Once this has been achieved purchase a nest box to imitate their natural breeding environment, the birds usually choose a small dense location therefore light and open conditions are not conducive to breeding. Look for cosy L shaped nest boxes, as well as some wood chippings to make sure your birds eggs remain secure. The eggs hatch within one month and need to be carefully removed to ensure the mother does not become distressed and aggressive. Hand rearing your birds is rewarding but requires lots of dedication. Chicks need to be kept in a brooder that can be adjusted for temperature as well as somewhere very clean as young chicks are prone to infection. Most breeders recommend spoon feeding (bent teaspoons are great shape wise) or syringes to feed your chick. Also ensure you have some quality scales to keep an eye on your chicks weight. Your birds cage is its home and needs to be a sanctuary for your pet. With this breed in particular the cage needs to be as large as possible with room for exercise and horizontal bars for ease of climbing. A large cage door aids the bird when exiting and helps with ease of cleaning and castors are great for manoevre ability as the breed requires the stimulation of being moved into different rooms. The more you can spend on a cage the better as these birds require quality housing to keep them safe and secure. Its well worth taking advantage of online discount codes to get the best possible pad for your new companion! 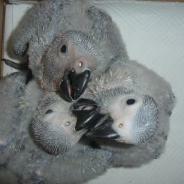 The African Grey Parrot is the perfect mix of brains and is we believe one of the most beautiful parrots of them all. This species of parrot has become quickly recognised as the best speaking parrot of the lot, I write this while listening to Reggie our family Grey chatters in the background, god knows where he picks up half the things he says, he seems to pick up words and string them together, now that’s intelligence to the higher degree!!! While many parrots learn some words or phrases, many cases have been documented of African Greys learning multiple lines of songs, prayers, or plays. 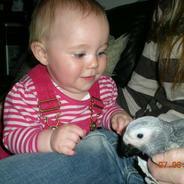 The Guinness Book of World Records lists the best talking parrot or parrot like bird as a African Grey named Prudle. Prudle was captured near Jinja, Uganda in 1958 and when “he” retired from public life in 1977 had a vocabulary of nearly 1000 words. The speed in which African Grey Parrots can pick up new words is phenominal, they can pick words only after hearing them a handful of times, so be warned if you are considering taking on a pet African Grey Parrot just be very careful what you say in earshot of it, Reggie has an amazing vocabulary of obsecenities, which can be somewhat troublesome when you have children or the boss visiting for dinner. African Grey Parrots don’t just mimmick speach they also pick up all storts of weird and wonderful sounds, Reggie has a habit of dialing a number on the mobile telephone, having a conversation with some random person, saying goodbye then hanging up with the beep of the phone. You could quickly find your pet African Grey mimmicking the microwave, other birds or animals you have in the house or even trumping if you have a flatuance problem. Many owners and some studies suggest that Greys (and other parrots) don’t just mimic but can use words learned in new combinations to convey new wants, needs and desires. Alex, a famous Grey that has been studied for years by Dr. Irene Pepperberg, invented the term “long yellow” to express his desire for more corn on the cob. A European study found Greys to have the intellectual capacity of a 5-year-old human child with the emotional development of a human 2 year old (read as terrible two year old). 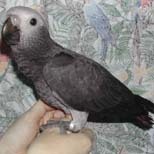 African Greys have become extremely popular in homes all over the UK and are not as exotic as other parrots you may wish to own, they are pretty easy to breed given the right conditions, they’re retrospectively inexpensive they don’t take up as much space and they love human interaction … the perfect mix. 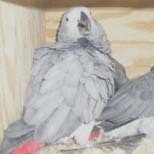 There are three species or types of the African Grey Parrot they are Psittacus Erithacus, Psittacus Erithacus Timneh and Psittacus Erithacus Princeps all of which are explained on the African Grey species page.